Setting up as a DJ in Second Life is something many residents have done, but what is less common is using a Second Life stream to VJ on YouTube. 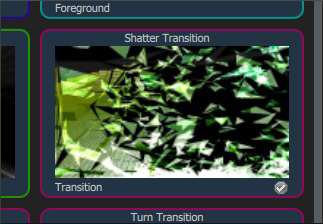 For those that may not be aware VJ means visual jockey and refers to someone who in one way or another creates imagery to match the music they play. In spite of the lack of Second Life residents who VJ it is something worth learning and maybe bringing in world. In order to VJ some software is needed. 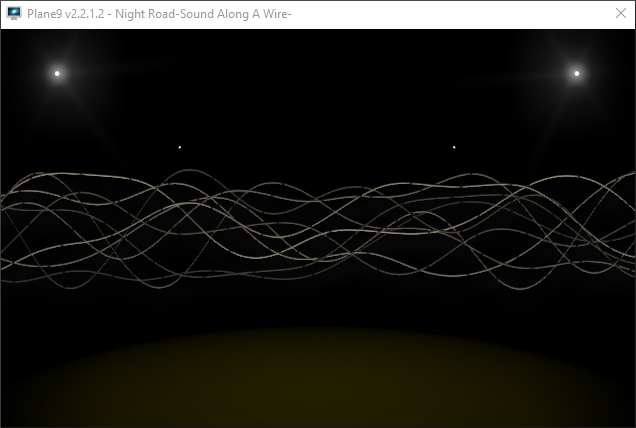 Firstly there is the stream that can easily be rented in Second Life, then there is the software to play the music. All DJs will be aware of these two items but to VJ add to the list music visualisation software and something to broadcast live to YouTube. One last thing you'll need is a verified YouTube account that is registered for live broadcasting, which usually takes about 48 hours to set up. To start go to your YouTube account and click on the movie camera icon and select Go Live, then follow the instructions. There are many music visualisers available, some free and some commercial, but a good starting point for a new VJ is the free Plane9, and for that reason we'll be using it for this tutorial. 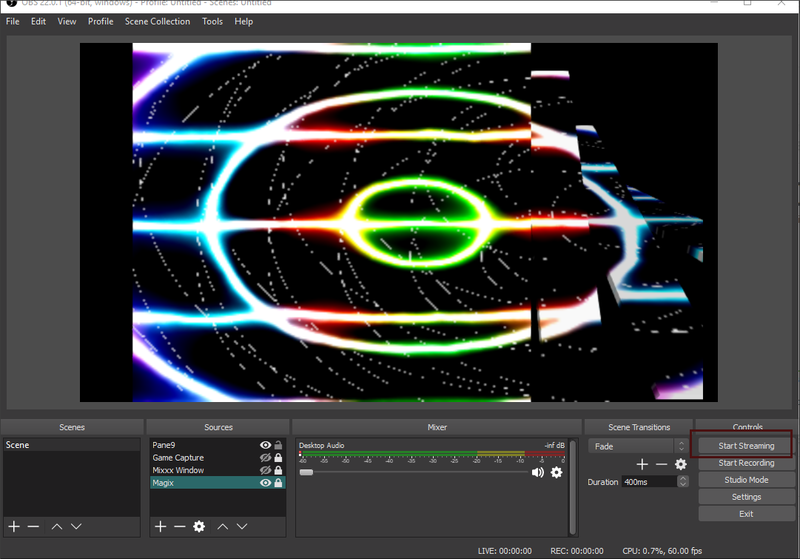 Plane9 is intended as a music visualiser for music played on a PC but when used with broadcasting software its possible to connect it with YouTube Live. Also, Plane9 can act as a screensaver for those that like such things. OBS Studio, or Open Broadcaster Software connects to the music visualiser then streams the imagery to YouTube. 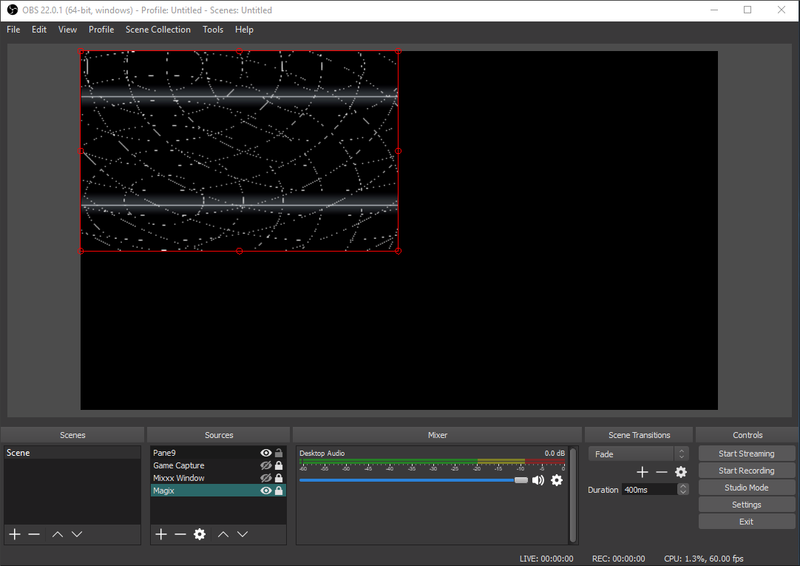 As with all software mentioned here, there are alternatives to OBS Studio, but since its free and works very well, this is what we'll be using for this tutorial. You may have noticed that there are two streams involved here, one for the music and another for the imagery. 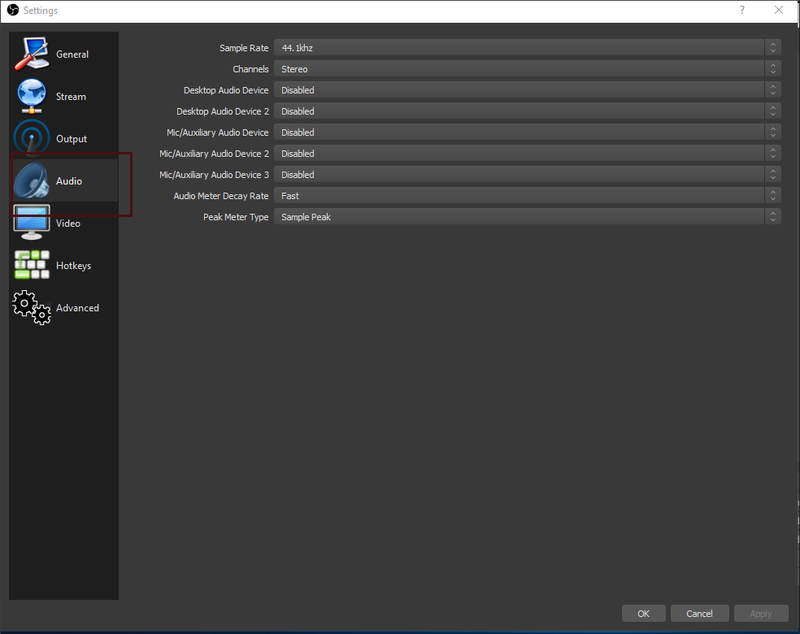 OBS Studio could be used to stream both but in order to stay within YouTube terms of service music should not be streamed to its platform. Instead we're going to add a link to a Second Life music stream, which will be explained later. Assuming you've downloaded and installed the software already mentioned, and your YouTube account is verified you can now begin to VJ. 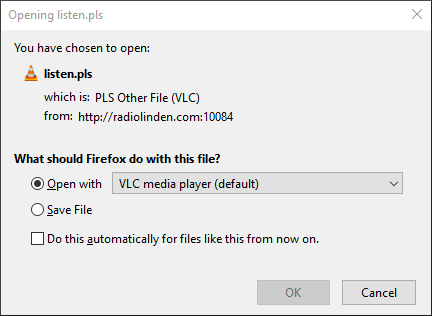 First, start up your music streaming software then follow the instructions below. 1/ Start up Plane9. Under the list of software installed on your PC there will be three choices for Plane9. Select Configure Plane9. 2/ When Plane9 is running it will look something like the image above. 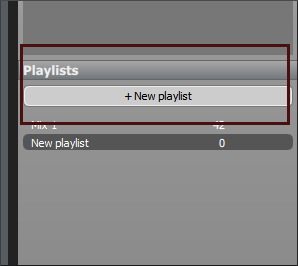 3/ To the right of the window will be a list of playlists. Hit New Playlist tab. And some are transitions. A visualisation in Plane9 will be a random combination of foreground and background imagery and a transition will determine how Plane9 moves from one visualisation to another. Therefore a playlist should consisit of as many foreground and background visualisations as you like, plus a number of transitions. To add any of the above to a playlist click on them in turn so a tick to the lower left of each thumbnail is circled in green. 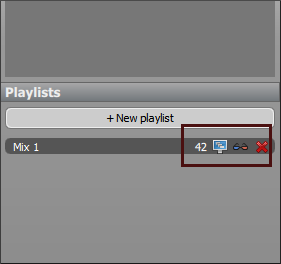 5/ Once you've finished selecting, double click on the playlist name to rename it. 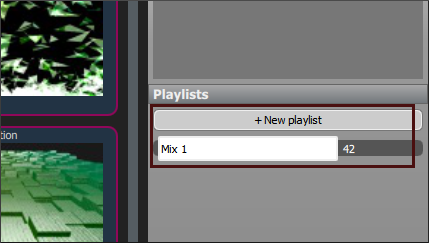 6/ To run a playlist, hover the cursor over its tab and click the screen icon that will appear. 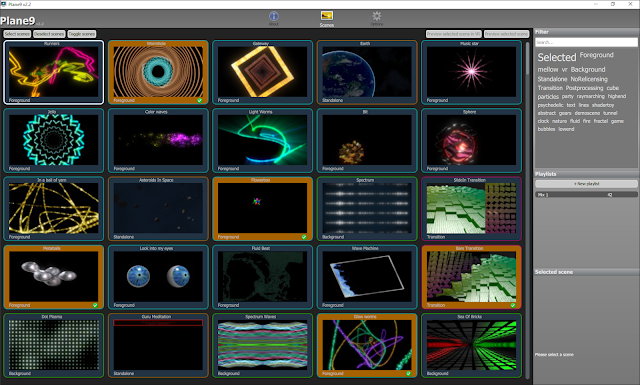 7/ A new window will open showing the visualisations, which will randomly change. They should respond to music playing on your PC. This window can be quite large so you may want to resize it by dragging its edges. Since there is no option to stop it being always on top of other windows it can be useful to drag it to the corner of the screen. 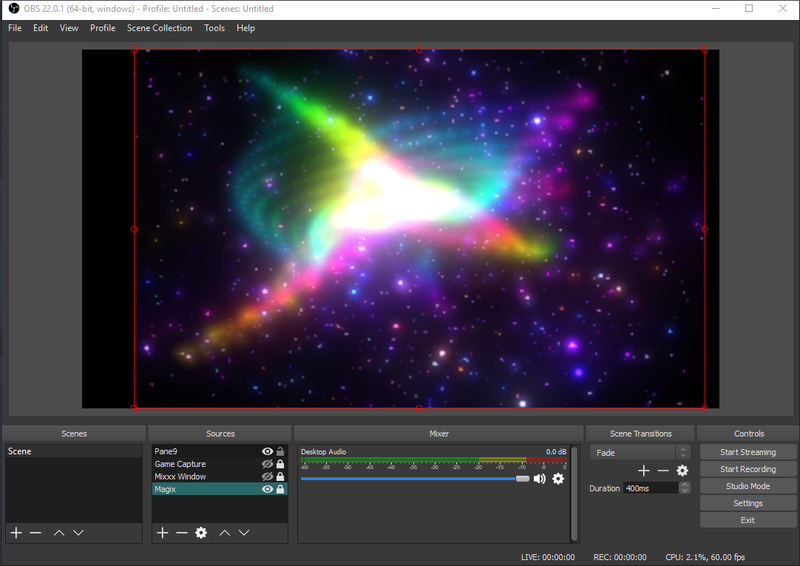 1/ When OBS Studio starts it will look similar to the image above. 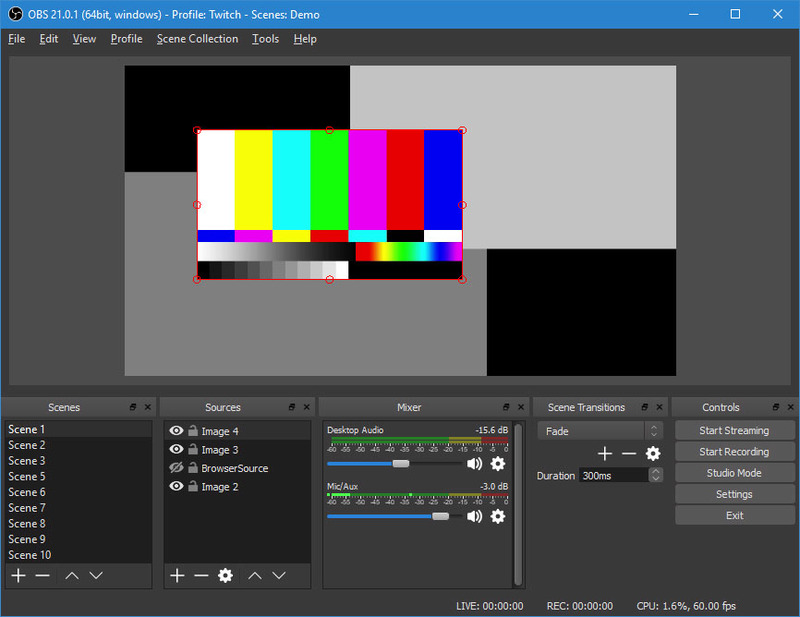 We want the Plane9 image window to appear in the main area of OBS Studio so it can be broadcast. To do this click on the + icon, highlighted in red, lower left. 2/ A window as above will open where you can name the source. In this case Plane9 will be the source. Click OK when done. 3/ There will now be three drop down menus to make selections from. 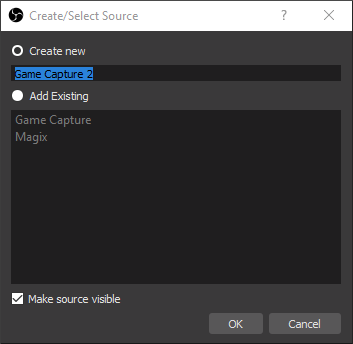 In the first select Capture Specific window. 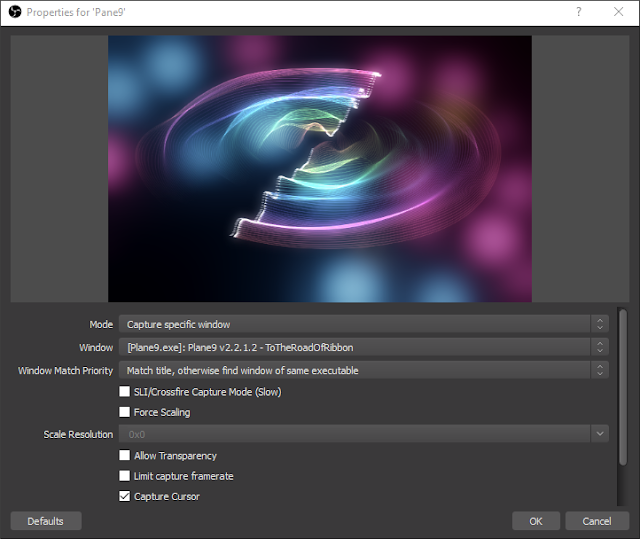 From the second menu select the Plane9.exe window, (which may also show the name of the visualisation that is running). In the third menu, Match title, otherwise find window of same executable has been chosen. Hit OK. The Plane9 visualisation window should now be visible from within OBS Studio. 4/ If the visualisation doesn't take up the entire viewing area click on it so a red border appears then drag it until the whole window is filled. 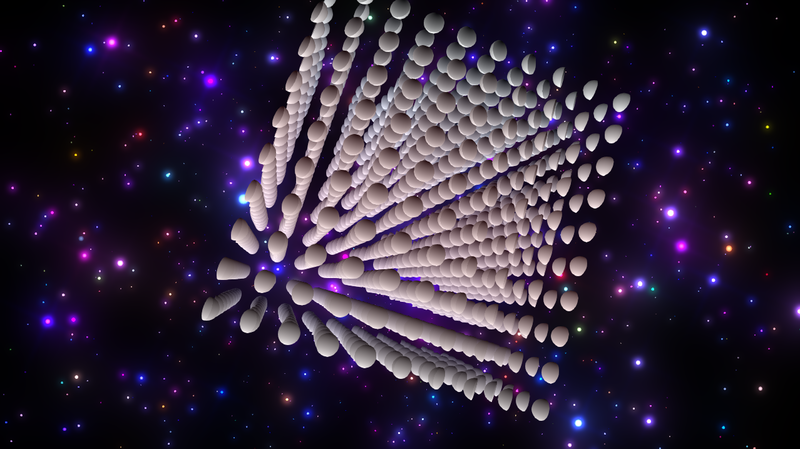 5/ The above image shows how the visualisation should appear once dragged to fill the viewing area. 6/ To be sure OBS Studio does not broadcast any music to YouTube click on Settings to the lower right of the main window then in the window that appears select the Audio tab. 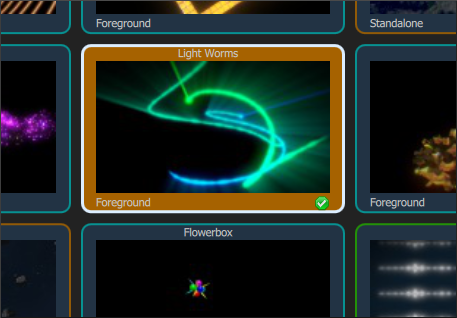 Now make sure all audio options are disabled, as in the image above Click OK when you're done. 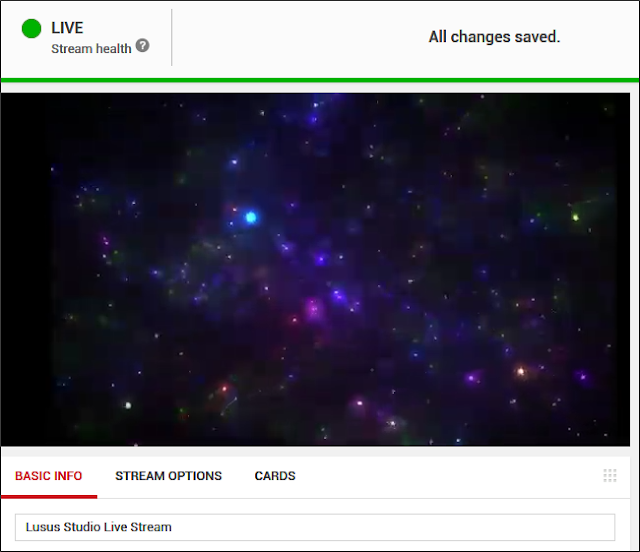 Now that OBS Studio is up and running all we need to do is connect it to YouTube so that what appears in the OBS viewing area will be broadcast live. 1/ Go to your YouTube channel and click on the movie camera icon. 2/ Now hit Go Live. 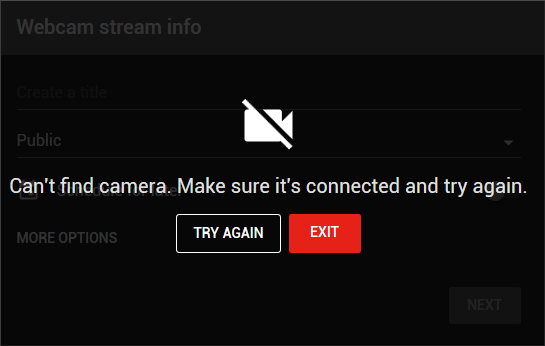 3/ Since we're not using a camera you should see a message like this, but don't hit Exit. 4/ Towards the lower right of the same screen should be the above button. Click this. 5/ The above information will now be visible. Drag the cursor over the Server URL space and copy it. 6/ Back in OBS Studio, hit the Settings button to the lower right of the main window. In the new window that opens select the Stream tab. 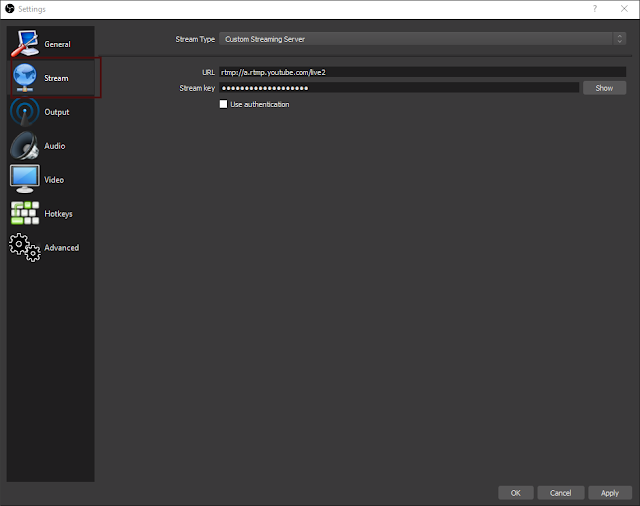 Make sure Custom Streaming Server is selected in the very top drop down menu. Now paste the Server URL we copied from YouTube into the URL space. Keep this OBS Studio window open. 7/ Back in YouTube, reveal the Stream name/key and copy it. Hide it again so no one can see it, since anyone with that key can broadcast on your channel. 8/ Back in OBS Studio, paste the stream key in the Stream key space. 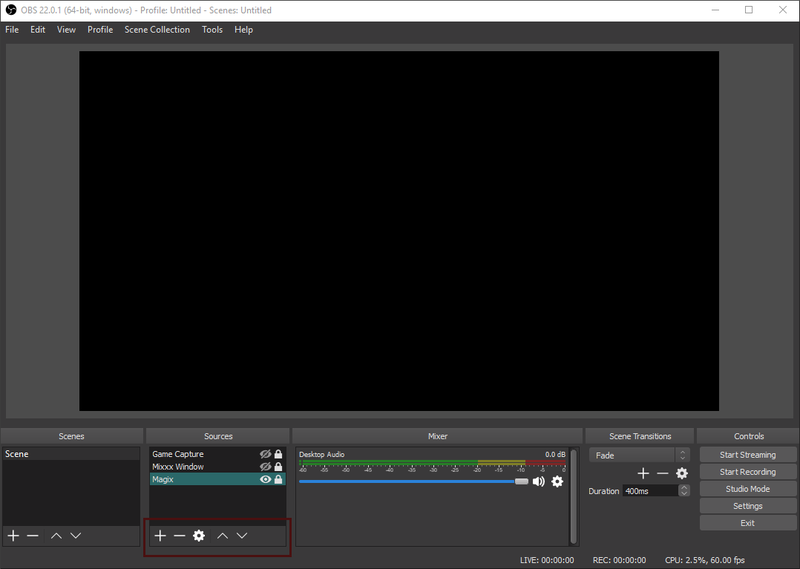 Now hit Apply then OK.
9/ Towards the lower right of OBS Studio is the Start Streaming button. Hit it when you're ready. 10/ In YouTube you should now see something like the above with a green live streaming button to the top left. The stream may not show immediatelly on YouTube, so refresh the page if you need to. Since its not wise to broadcast music on YouTube, a work around is to paste a link to your Second Life stream on the YouTube live broadcast page. 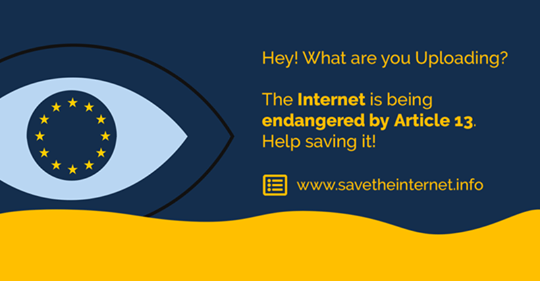 1/ Paste the URL of your stream into your browser so you see something like the image above. Right click on the Listen tab and select Copy Link Location (the wording of this may change depending on your browser) from the drop down list. 2/ Add some info about the live stream to the appropriate area on YouTube and paste the link to your music stream. Now when anyone clicks the link a window similar to the above will open allowing them to listen to your music whilst watching you VJ live. Thats essentially the basics to getting started VJ-ing with a Second Life stream on YouTube, and although there is more that can be done whilst VJ-ing, this will be covered in later tutorials. 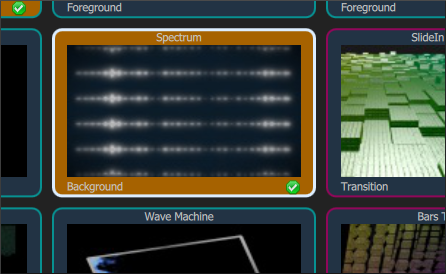 As a final note to those concerned that VJ-ing on YouTube during a Second Life DJ set may cause lag, the above image shows my frame rate during a recent VJ test. 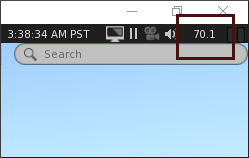 In fact streaming to YouTube at least in this instance didn't seem to affect Second Life at all. Below is a vid showing a recording of a test VJ session of YouTube, sadly with no sound, but it gives an idea of what can be done. Good luck with your own VJ sessions and come back for more tutorials soon.